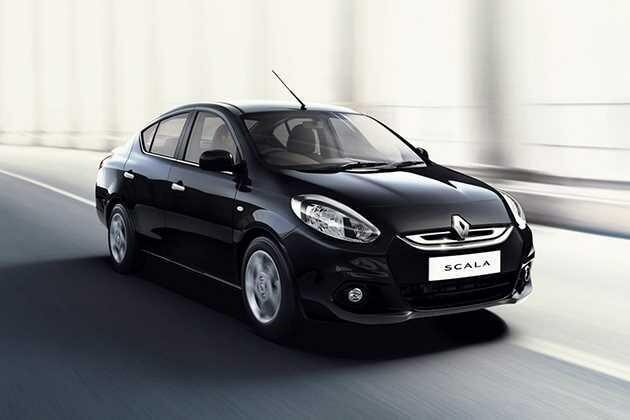 Say hello to the brand new offering from Renault, called Renault Scala. The new sedan by Renault is quite edgy, pretty, stylish and definitely powerful. The new Renault Scala has been launched with both engine options- diesel and petrol. The Renault Scala petrol RxE is expected to fetch quite an amount for revenue for the firm as the market inclination is towards the petrol cars. Renault Scala petrol RxE has been blessed with all the qualities and traits that one would like to see in their premium sedan. The petrol engine here is quite dynamic and aggressive and has the ability to give out peak power output of 86PS along with a maximum torque of 200Nm. the five speed manual transmission coupled with the engine makes sure that the sedan gives an excellent performance on road and deliver a great mileage as well. The looks of the Renault Scala petrol RxE are quite impressive. The company has put in a lot of efforts to make it appear tempting and alluring. The front profile of the car has been done quite well. The interiors well complements the exteriors. The car has been blessed with numerous high class features. The major ones comprise of air cooling system with heater, electric power steering, power windows, ample of legroom and headroom, advanced audio system with controls mounted on the steering wheel and so on. The safety department of the car also doesn?t let down and comes powered with ABS, EBD and responsive braking system and airbags. The new Renault Scala petrol RxE has the good looks that have been running in the family of Renault. The exteriors of Scala are very edgy and trendy. The front façade is one of the major highlights on the outside. The Renault logo has been positioned centrally along with the front grille and air dam that gives the car a very robust stance. The headlamps are very attractive and have a very eye-hawking feel . However, the side profile of the car has taken hints from Nissan Sunny, but there is alloy wheels adorning the bold wheel arches. The rear end of the car has been incorporated with chrome finished tail lights. the high mounted stop lamp have been located in a correct position and the rear bumper done with keen attention adds on to the elegant look of Renault Scala petrol RxE. The interiors of Renault Scala petrol RxE are very impressive and leave no room for error. The car is blessed with some high class interiors, which act as a standout element for the car. The premiumness oozes out from every angle of the car. The high quality fabric upholstery used for the seats is just awesome, while the fabric door trims along with waterfall type console inside the car add on more charm to the interiors of the car. Interior wise, the car will give a tough competition to its challengers comprising of Nissan Sunny, Toyota Etios and Honda City. The comfort features in the new Renault Scala sedan are absolutely amazing and up to the mark. The car has all the things that one would like to see in their lavish sedan. The car comes with electric power steering fir smooth and high class handling, utterly efficient and effective air conditioning system with heater with manual climate control, outside temperature display, audio system with Am/FM radio and audio controls mounted on the steering wheel , smooth gear shifting, digital odometer, tachometer, speedometer , sufficient amount of legroom and headroom for all passengers, trunk light and ample of luggage storage space. All these features make sure that the car is extremely comfortable and the passengers get a wonderful experience during the ride in Renault Scala petrol RxE. The engine and performance of Renault Scala petrol RxE is not disappointing at all. Renault India knew for the fact that the Indian car bazaar has a great demand for petrol cars and the credit to this goes to sky rocketing petrol prices. Under the bonnet, Renault Scala petrol RxE is fitted with a XH2 that has a displacement of 1498cc . This petrol engine is quite robust and aggressive and is capable of churning out peak power of 97.8bhp at the rate of 6000rpm along with high torque of 134Nm at the rate of 4000rpm. The engine has been coupled with five speed manual transmission, which promises all to deliver an amazing performance on road. The car doesn?t take up much of time from reaching 0 to 100kmph speed mark,the timing is just 13 seconds . Even the mileage delivered by the car is quite awesome, which helps keeping things under budget and easy. Therefore, as far as the technicalities of the car are concerned, Renault Scala petrol RxE is top notch and has been blessed with all possible impressive engine specs. The braking and handling of Renault Scala petrol RxE are remarkable. The braking system here is utterly responsive and makes sure that the car and the passengers are safe and secure in case of accident. The braking system comprises of disc brakes on the front and drum brake for the rear . The suspension system of McPherson Strut and Torsion beam makes sure that the handling of the car is extra smooth and hassle-free. The sedan also comes with anti lock braking system that averts the car wheels from locking up when immediate brakes are applied. The safety section of the freshly launched Renault Scala petrol RxE is top-class. The car maker has taken care of the passengers and the car. The body frame is strong and keeps the ability to absorb maximum force when in accident. On the other hand, the airbags are present for the driver and front co-passenger along with seat belts for all passengers, side and front impact beams, alloy wheels and anti lock braking system. Good looks, comfy interiors, great performance on road are the major highlights of Renault Scala petrol RxE. High price and less safety features are the minor drawbacks of Scala. Renault Scala is available in 5 different colours - Pearl White, Metallic Blue, Mettalic Silver, Solid Black, Metallic Red. Renault is Offering Scala RxL Diesel at petrol counterpart price - Rs. 8.01 Lac!